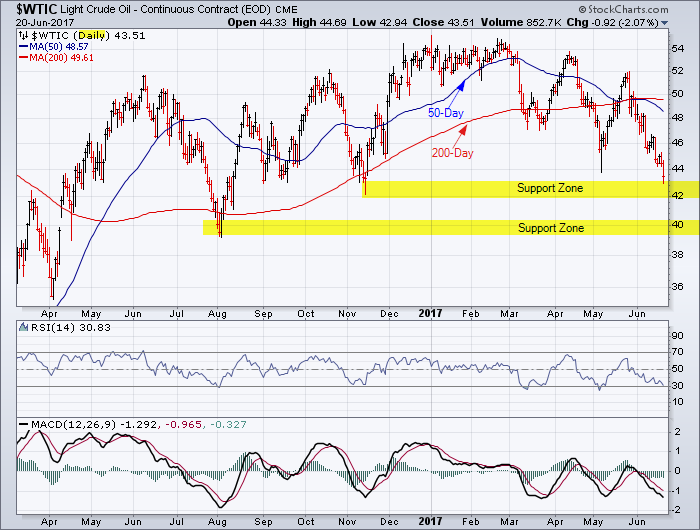 West Texas Intermediate is testing major support in the $42 to $43 price zone. There is a high probability this support zone will not hold which would put a test of the $40 price zone in play. If you need another negative, the 50-day moving average has crossed below the 200-day moving average: the old death cross. Reference my last chart analysis for WTI posted on May 4, 2017. This entry was posted in Other Topics, U.S. Indexes and tagged chart, WTI on June 20, 2017 by Trader.